In 2007, writer Christopher Barzak won the Crawford Award for his debut novel, One for Sorrow, the coming-of-age story of a teen who sees the ghost of a dead schoolmate. The book was turned into a film, Jamie Marks Is Dead, which debuted earlier this year at the Sundance Film Festival. Barzak, who holds an MFA in Creative Writing from Pittsburgh’s Chatham University, teaches fiction writing at Youngstown State University, in Youngstown, Ohio. He called us from his home to talk about the adaptation of the novel. Talk about what inspired the concept for the novel. It’s been awhile. I wrote it when I was 27 and 28 years old. I just turned 39. It was written a decade ago and published in 2007. One of the things I wanted to do was set a novel in the Mahoning Valley, in and around Youngstown. Growing up, I read to investigate other places that I couldn’t get to. I realized that I never came across a book that was set here. I was also interested in investigating what adolescents are facing in a region where there has been a lot of economic loss and not much opportunity. When you’re going through a time that is difficult no matter where you are, you can have these added pressures of figuring out a life for yourself when there aren’t a lot of options. I also was interested in dealing with personal fears I had from when I was a kid and come to grips with the idea that we all die. Is the film set in Youngstown? [Director Carter Smith] filmed it in an upstate New York town called Monticello. I think some of it also was shot in the neighboring town of Liberty. One is a rural township and the other is an old paper mill town that’s lost all its industry. He was dealing with the same kind of landscape. I did a set visit and it was reminiscent of this area so it has the look and feel of the book. The only people who will look at it and say it’s not Youngstown are people from Youngstown. Does the film follow the novel closely? It does. There are certain things that have been changed but that’s par for the course. The novel is 320 pages long and the script is 120. They can’t import absolutely everything. There are minor characters who were cut. In the movie, the mother is a single mother but in the book, it’s a mother and a father. In the book, dad is a down-and-out alcoholic who is constantly losing work. They dropped him from the script and wanted to enhance the mother’s desperate situation. There are elements that didn’t make it into the film and one of them is why the title has been changed. There’s a rhyme that Adam’s grandmother taught him as a kid. It’s a way to count crows and it starts with “one for sorrow.” It’s this perspective that she taught him and it enables him to interact with things that other people can’t see. Since they didn’t keep the grandmother and this mythology about seeing unseen things, the title no longer made sense. Did the director consult with you on the film? I didn’t consult with him when he was writing the initial script. He showed me a draft at one point and wondered what I thought. Later, he emailed me some questions that producers had about various aspects of the script and asked what I thought. He was looking for my insight into characters’ motivations. How’d he come across the book? He found it in a bookstore and read it on a flight. He was around 80 to 100 pages in when he thought it would make a great film. He fell in love with the characters and the setting. He first optioned it in the spring of 2008. It’s been a long haul. They bought the rights at the end of 2012. 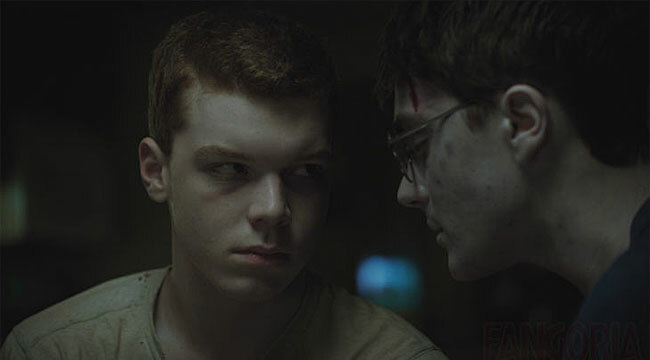 Cameron Monaghan plays the central character, Adam. Talk about his performance. I was really pleased. When I was first found out that’s who was cast, there was some cognitive dissonance. I had never imagined Adam as a redhead. I started watching the show Shameless and Carter sent me videos of his audition. I thought he was perfect. He captures a character who is both rough around the edges and vulnerable. That’s a hard mix to play. He’s astounding at capturing a tender underside masked by a tougher exterior. At first, I thought the film would act like a commentary on bullying. It ultimately shifts its focus a bit. Does the story have an anti-bullying message? I don’t think it has a message. Some of the idea of it being a bullying awareness movie is there but not in a message format. It’s there to be observed if you want to observe but it’s not a hammer over the head. I think that some of the people who have spoken about it in that way are seeing that from a personal point of view. It’s not necessarily the point of the story. You see early on that the kid was mistreated by others. His presence only becomes active when he is dead or an absence. It’s an implied kind of thing that is there for anyone who wants to see it. You’re hosting a Q&A session about the movie. Is that something new for you? I’m used to do doing interviews about my writing, but not about a film based on my book. It will be different. I have some insight into the director’s perspective from our conversations but ultimately the film is its own entity. [Carter Smith] worked hard to capture the essence of the main story and the relationship between the three kids and the conflict that was there but it’s its own thing in the end.